Beauty Labo in French Chocolate, it supposed to gives my hair a pretty soft dark brown shade which will looks elegant and mature I think, LOL. It is very easy to use, all you need to do is mix the powder and mixture inside the milk shake container, then shake it like crazy for 30 times. The harder you shake the better the mixture. The roots always turns like that if I dye my hair right after I use any hair bleach. I think next time I should wait for 1 week maybe, but I can't live with that yellow blonde hair color for 1 week lol I looked so weird! So this is the whole result! It's not really even because my hair is so so thick and the mixture is so less, that's why I make it like ombre style. Actually I kinda like it, but this just like my previous hair color, not similar like the color on the box. I think that because my before hair was too light. ._. Some outfit shots before I went out with some friends! I love the result even though it's a bit different from the box, lol. The hair dye doesn't harm my hair and it does makes my hair a bit dry but still ok la. 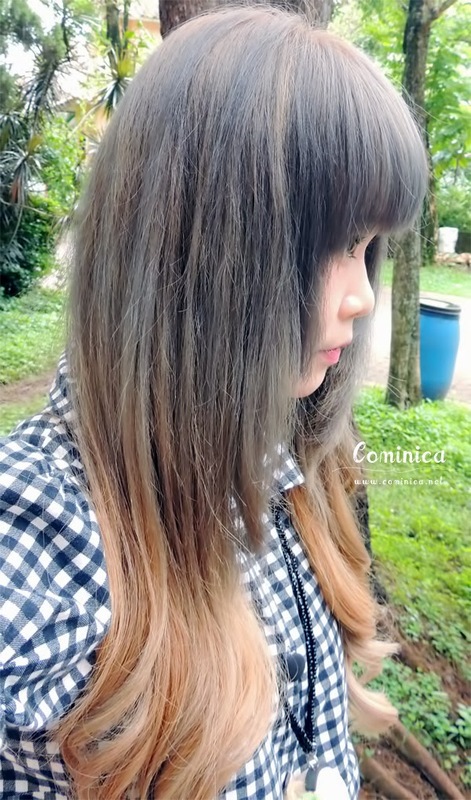 My hair still easy to manage and style, hehe. It looks pretty and I like how you turn it into ombre since it doesn't have enough product for your long hair!! lol. Oh wow, that colour looks lovely on you! I just fell in love with this hair color *__* It really suits you!